that I will always be haunted by thoughts of a sun-drenched elsewhere." Oh, boy, are we looking for a "sun-drenched elsewhere!" 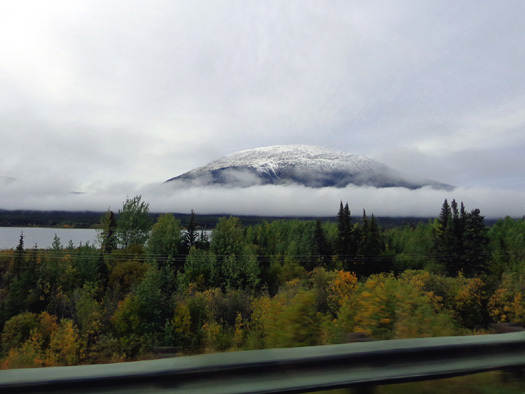 This was our third day in a row of rain and overcast skies on our way through Alaska and Canada as we snowbirds head south for the winter. The mountains/hills were even more obscured by clouds today. 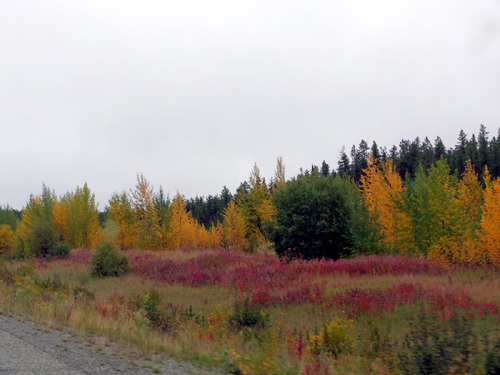 This scene is just east of Whitehorse. After months of predominantly cold, wet weather we're a little desperate for some warmth and sunshine. We would have stayed in Whitehorse another night if it had been warmer and drier. 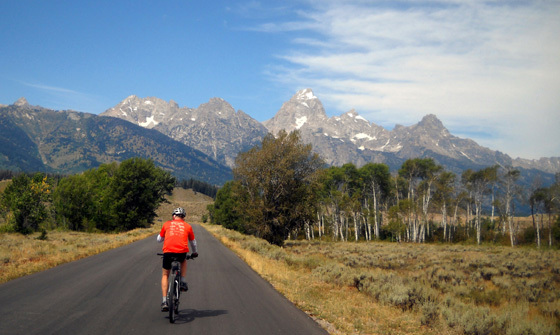 We�re kind of in a hurry to get to the Lower 48 now. 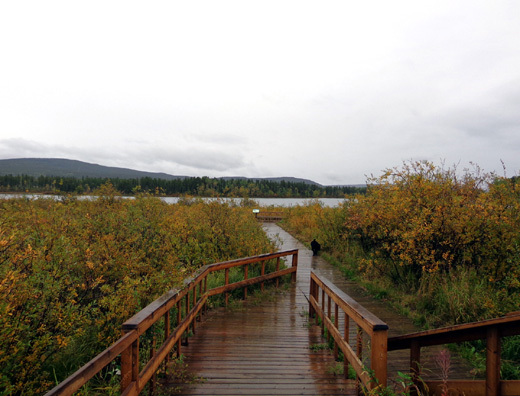 I doubt we�ll stop to do much of anything touristy the rest of the way through Canada unless the weather improves significantly in the next few days. 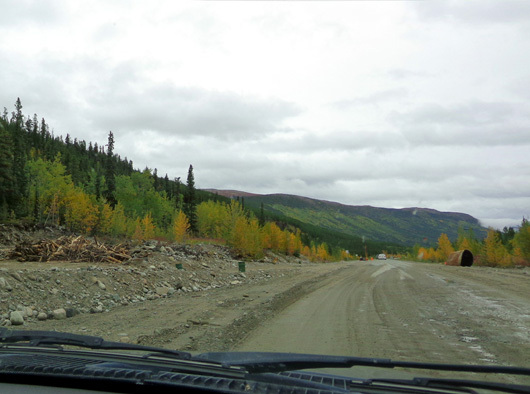 It took us a little over five hours to drive from our campground in Whitehorse to our campground in Watson Lake, Yukon. 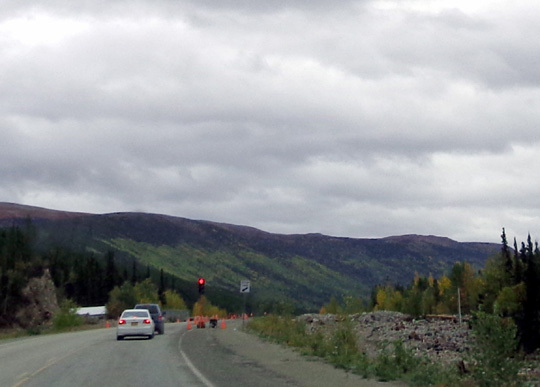 We made several short stops for road construction, lunch, potty breaks, etc. We could have driven farther but we wanted to stay in Watson Lake overnight -- not for nostalgia's sake (ha! ), just convenience. Since we'd been a captive audience there for five days in June we knew we could get a campsite with water and electricity for a decent price again at Tag's RV Park behind the Tempo gas station. We knew we had a good place to walk Cody and ride our bikes this afternoon/evening if the weather cleared a little bit. What we didn't know was how far we'd have to drive east of Watson Lake this afternoon if we kept going to find another suitable campsite with electricity. 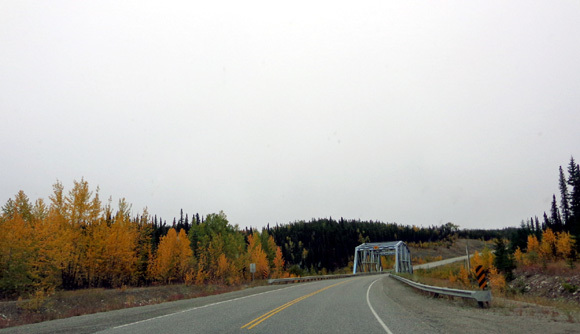 Towns are few and far between on the Alaska Highway. We're trying to get sites with hookups as much as possible on the way through Canada instead of boondocking. 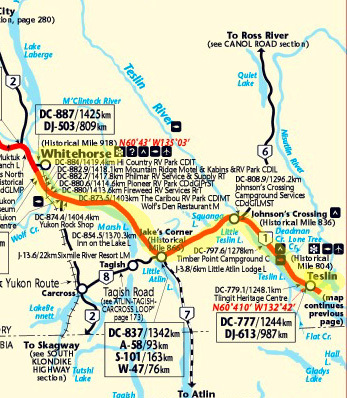 ROUTE: all on the Alaska Hwy., going more east than south today. If you look closely at the map directly above you'll see that we crossed into British Columbia for about 42 miles, then back in the Yukon. We'll cross back and forth between those two provincial borders several times tomorrow. TRAFFIC: still fairly light all day but increasing as we get into slightly more populated territory. We saw more RVs and trucks today than yesterday. Some of the RVs were headed to Alaska, not away from it. What's with that? ROAD CONDITIONS: gradually improving as we travel south and east in less remote areas. We were able to drive a little faster today because of less road work. We watched the workmen as we waited for a large truck and other vehicles to drive slowly through the narrow lane that was open. 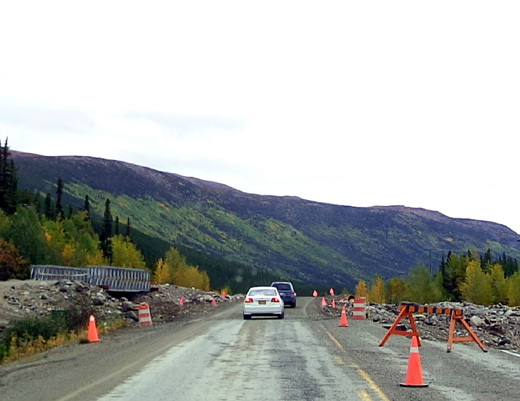 Traffic is still directed over the westbound lane (above) and the dirt/rock pioneer road they built in June is still being used. The only thing new that we saw today is a parallel detour road with a steel bridge (two photos above) but it wasn�t being used today. 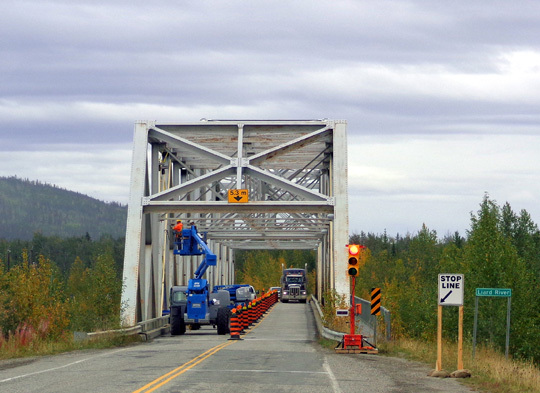 I guess they direct traffic to it when they�re working on the highway. We identified another place today where a culvert had been replaced and new pavement laid, as well as the locations of two nasty mudslides in that June mess. We couldn�t see any obvious damage on or along the highway in the low-lying Rancheria area that was badly flooded then, however. We had to slow down several miles for those areas because visibility was so limited. 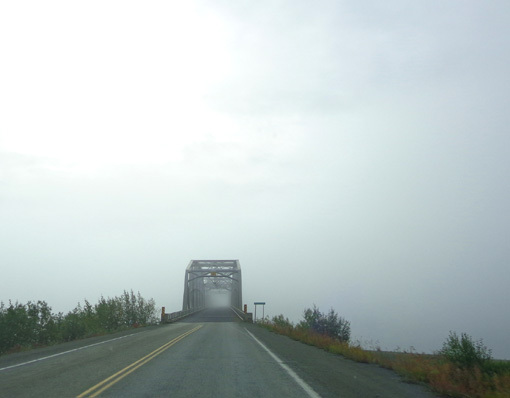 It�s a good thing we saw the spectacular Nisutlin Bay Bridge at the confluence of the Nisutlin River and Teslin Bay in June � it was totally socked in today! The first picture shows the bridge and surrounding area when we saw it in June. Even though it was overcast the clouds were high enough then to see even the summits of snow-covered mountains in the distance. We missed seeing a lot of mountains on today's journey. 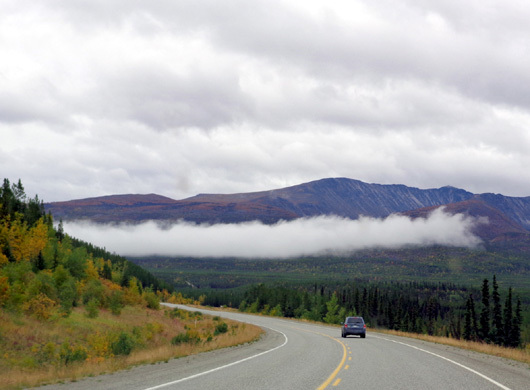 At 1,917 feet, this is the longest span on the entire Alaska Highway. 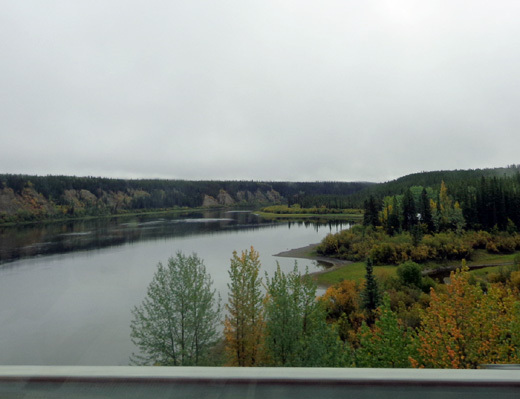 It was a spectacular ride over the bridge in June when we could see the water and surrounding landscape. 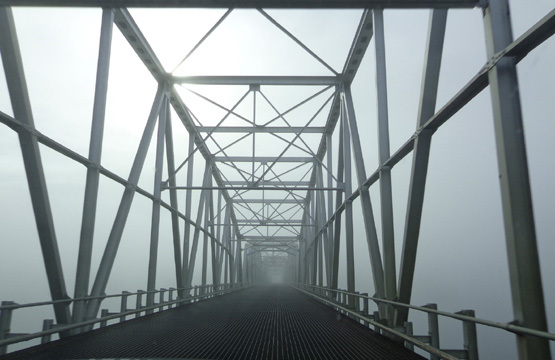 Today, however, it was a little scary without being able to see anything around us or even to the far end of the bridge. Call me paranoid, but who knows how well these bridges in remote areas are built and maintained? Even in the U.S. many bridges are aging and some have given out before being repaired sufficiently to hold all the traffic that uses them. It sprinkled briefly a couple times and the sun almost came out a couple times -- but not quite. 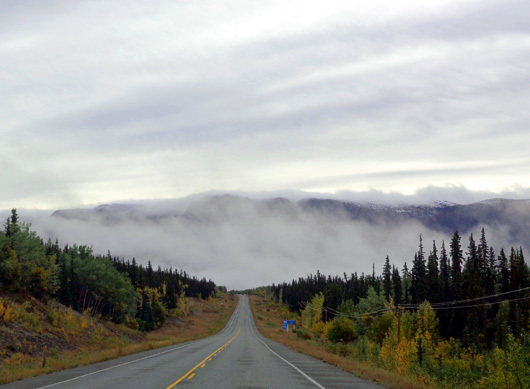 Some of the clouds were very low east of Whitehorse and through the Cassiar Mountains, resulting in some interesting photos. It must have continued raining through the night because there were lots of new puddles in low places when we got up on Sunday morning. 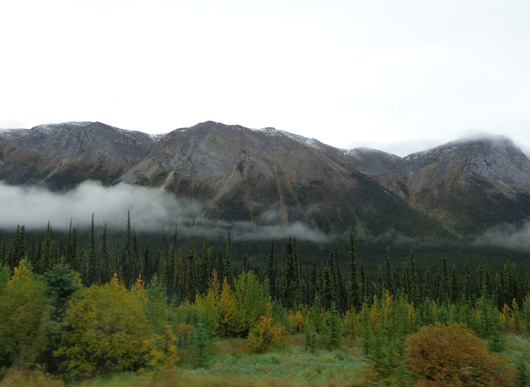 TERRAIN: more mountainous as we headed southeast through the Cassiar Range. We crossed the Continental Divide today at KM 1120 at only 3,217 feet elevation; shortly before that we hit 3,269 feet on our GPS, our high spot for today. We drove most of the way between 2,400-2,800 feet elevation today. The aspens/birches are still pretty green below 3,000 feet. 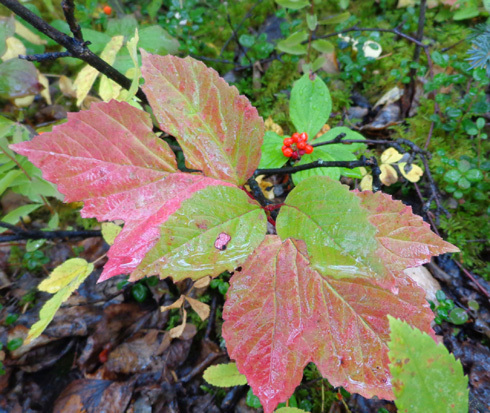 There was more red color on the ground at 3,000 feet and above. 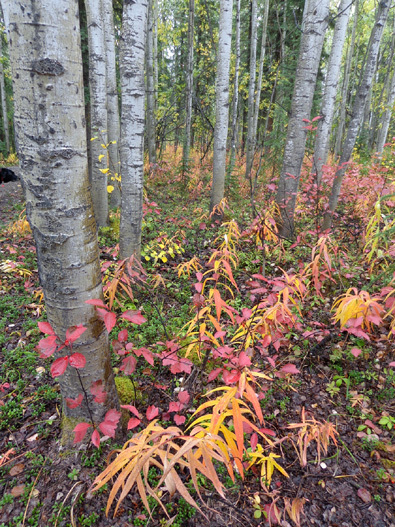 Even there, the aspens/birches aren�t peaking yet. There are some low red shrubs near the top of the mountain in the distance. 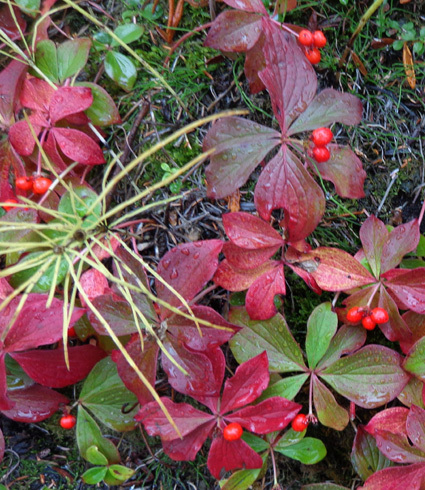 There were some red plants right along the highway, too. The whole Pacific Northwest is full of streams and lakes. 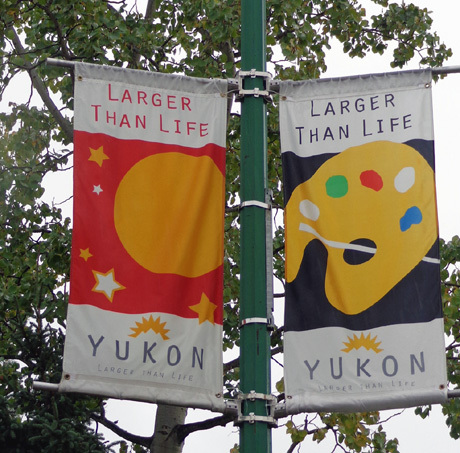 So are the sections of the Yukon and Brtish Columbia through which the Alaska Highway passes. 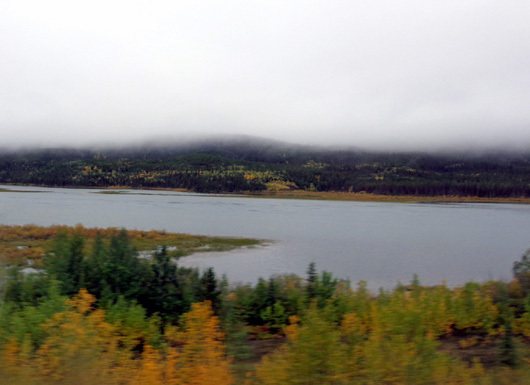 Marsh Lake, between Whitehorse and Jake's Corner on the Alaska Hwy. 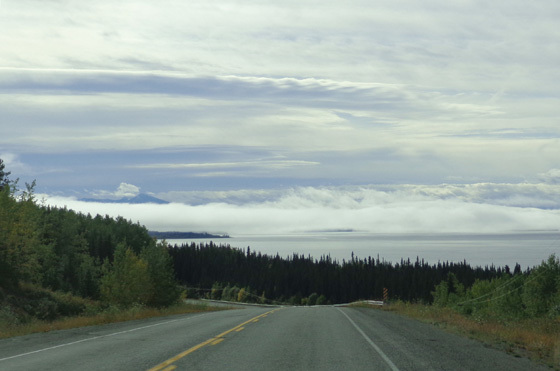 It's sorta hard to tell where the clouds end and the water in Teslin Lake begins. Both lakes were on my side when Jim was driving today and I was able to get some pictures of them this time. 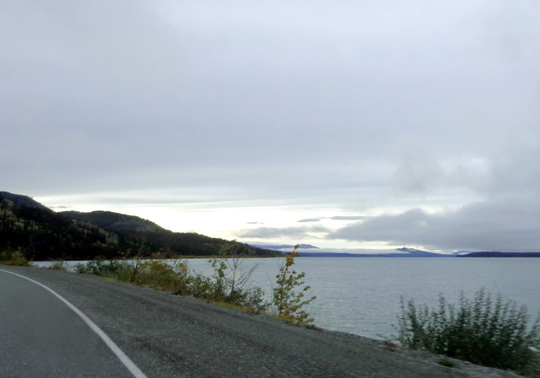 Teslin Lake is visible off and on from the Alaska Hwy. 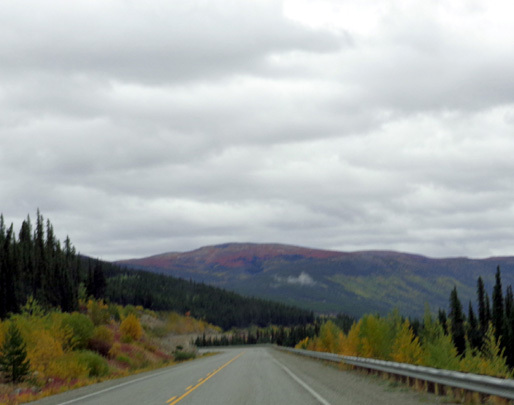 for about 60 miles between Johnson's Corner and Teslin. We saw more businesses today that are closed for the season. 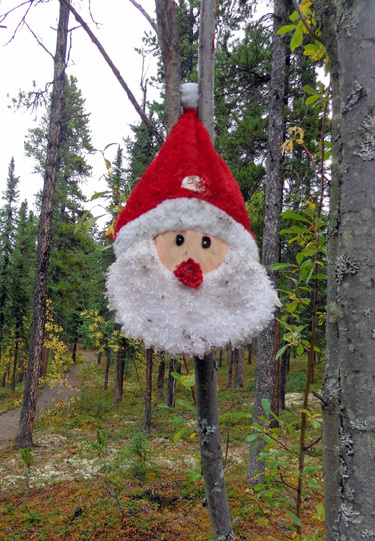 All three private campgrounds in Whitehorse are still open, however, as are the two at Watson Lake. We saw three runners with bib numbers heading to Whitehorse this morning. They are part of a relay race that began in Skagway yesterday and ends in Whitehorse. It reminded me of the N. Georgia relay I ran long ago when I was still doing road races. There are several places along today�s segment of the highway where folks have written their names in rocks along bare banks. Some are illegible, some more recent. I didn't get pictures today or in June. I wanted to take a short walk to see Rancheria Falls at KM 1112 but missed seeing it in time to stop today. 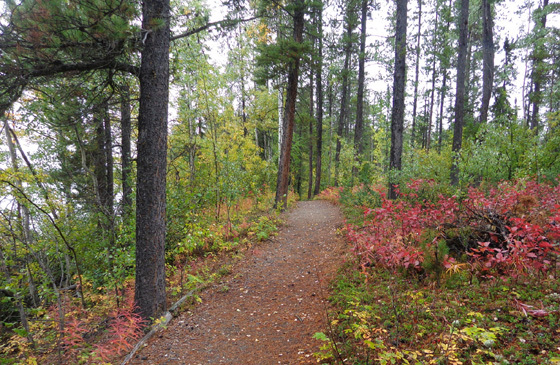 It's in a recreational site with a gravel and boardwalk trail to the falls. 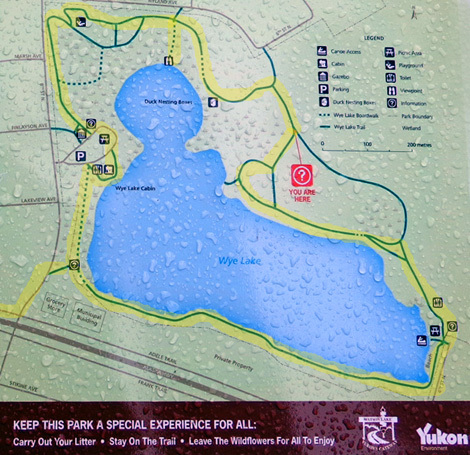 There is a large parking area with restrooms at the trailhead. Not sure we could have seen the falls with all the low clouds today. WATSON LAKE, WE REMEMBER YE WELL! 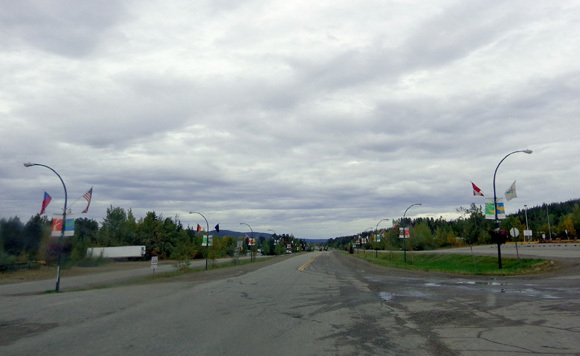 We reached today's destination, the town of Watson Lake, about 2:30 PM. About 1600 people live here. Many more than that pass through on their way to and from Alaska every summer. 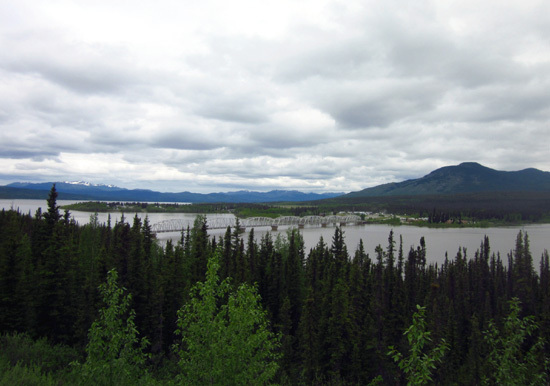 It was kind of nice to be back in the town where we had to unexpectedly cool our heels for five days in early June after heavy rain and snowmelt in the mountains farther west in the Yukon severely damaged several sections of the Alaska Highway. Other than the unexpected delay, we had a pretty good time in Watson Lake. We were extremely lucky to have our own RV and a campsite with hookups during the delay. So many other people who were stopped there were literally "stranded" for up to five days. The townspeople did all they could to offer housing and food for the ones that didn't just turn around and go back the way they'd come. the shoulders and two access roads were packed with RVs, semi trucks, tour buses, and other vehicles. 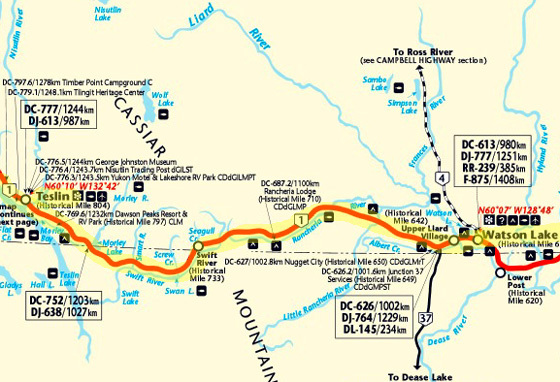 Before choosing a campsite we got diesel ($1.409/liter) at Tempo Gas, which owns Tag�s Campground behind the store. We chose the same back-in campsite that we had in June. The cost is the same -- $23.10 Canadian with tax for water and electricity. There is a dump station if we need it. We have a slow WiFi signal and some TV stations. We�re glad we stayed at Pioneer last night and Tag�s tonight in the cold rain; having electric heat and WiFi is a lot more comfortable than not having them. 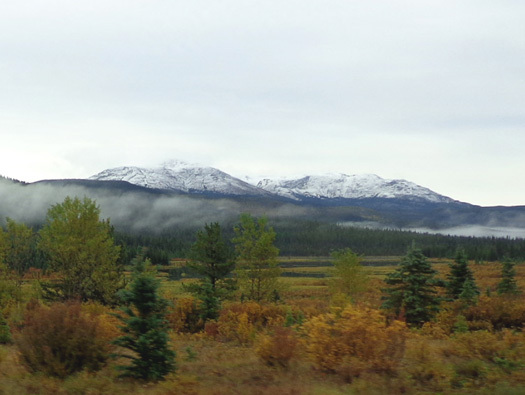 Boondocking is fun when it�s warm and dry but not when it�s cold and wet. 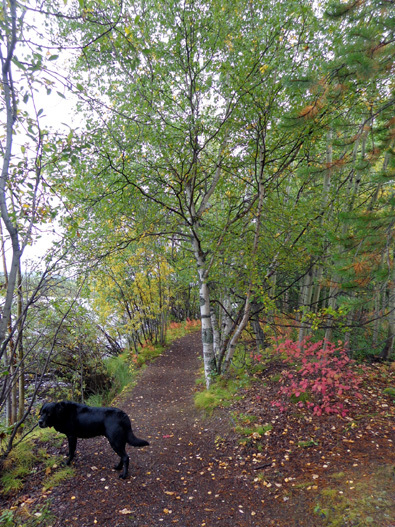 When we were in Watson Lake in June I had the opportunity to walk the trails around pretty Wye Lake with Cody several times. The hike is about three miles out and back from our campground. After supper I decided to take Cody for a walk over there again. It was raining off and on so I took an umbrella. Along the way we have to walk around or through the popular signpost forest. Because of the rain I didn't look real hard but I saw a few 2012 dates that had been added since June. It was still spring plant-wise when we were here in early June so there were lots of new green leaves on plants and wildflowers in bloom. There aren�t any flowers blooming now except a few dandelions in the grass near the picnic/gazebo area. It�s interesting to see the place in two distinct seasons � late spring and early fall.